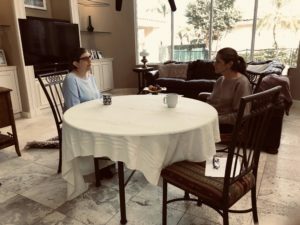 I am proud to announce that today, March 15, in honor of my mother’s birthday, I’m premiering Talking About Suicide Loss With, a series of short interviews on YouTube with other loss survivors I’ve met who are public with their story and creatively use their experience to help and educate others. The goal, like with The Silent Goldens documentary, is simply to promote awareness about the continued and unique pain suicide loss survivors face and encourage all who suffer in silence to start their own conversations. After 30 years of keeping silent about my mom’s cause of death, I first discovered it was OK to talk about suicide when I volunteered at a suicide prevention walk a few years ago. It was the life-changing revelation that led me to dive head first into the world of suicide awareness. 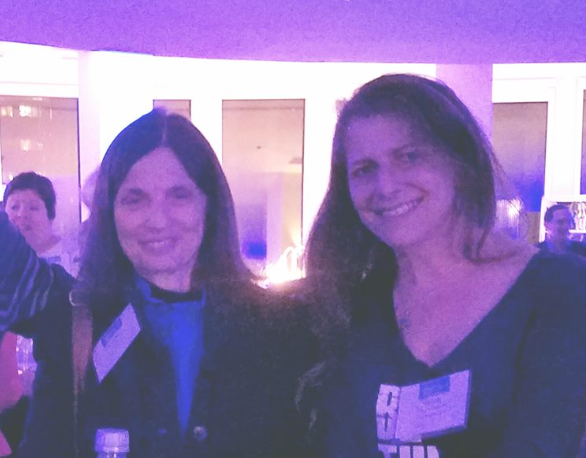 Though conferences, as a board member for the Greater LA Chapter of the American Foundation for Suicide prevention and going to a suicide loss survivor support group through Didi Hirsch Mental Health Services, I’ve been privileged to meet so many survivors who combine their pain with their unique skills to offer help and hope to all left behind. Suicide loss needs to be in the public conversation. The issues never go away for those who face it. The pain needs to be understood. The survivors need to share their grief as people can for any other type of loss. The guests I am talking to gave me the space to open up about my story and the courage to take it public. Now I simply ask them why it was important for them to speak out and how it changed their relationship to their grief. Talking About Suicide Loss With Mariette Hartley is the first episode. She is an Emmy award-winning actress and author of the bestseller Breaking The Silence, detailing her family’s struggles with alcoholism, depression, and eventually her father’s suicide. I knew who she was as an actress but was surprised to discover she had been a founder of the AFSP in 1987. I was then stunned to find her name listed as the peer support facilitator for the support group I was assigned to (not your typical celebrity encounter in LA, at least for me). It is something she’s been doing for years and has remained dedicated to helping the loss survivor community at large. It was during a group meeting when she and I were sharing the damage the silence after suicide can create in families, and my smartass remark about how in my home “silence is golden” that sparked the idea for The Silent Goldens documentary. We will post them on Facebook and promote them on Twitter and Instagram as well, so please follow us if you haven’t aready! Also! We are currently running a GoFundMe campaign to expedite the creation of a video presentation about the project to use for grants and seek funding from other sources. Our goal is April 1 so we can finish the tape by our first grant deadline on April 20. Check it out and please share. Thanks! Chris teaching Cousin Henry how to make magic through the lens. It has been just over a month since I completed the first official shoot for The Silent Goldens documentary. It, I’m happy to report, a resounding success! My family was very open and pointed with their opinions and feelings, and I was pleasantly surprised that no one seemed nervous about the cameras. The crew members were all wonderful, artistic, professional, and all the good things you’d want in a crew (shout out Danny, Dre, Karen, and there was great rapport between themselves and with my family for two long and emotional days. 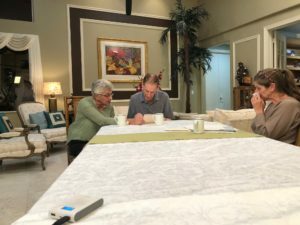 Mom’s brother and sister-in-law reading her final note for the first time. For me, the experience was overwhelming in a variety of verygood ways. On a personal level, I truly don’t have the words to express how thoroughly touched I was by my relatives coming together to have these intensely personal, raw, fully open conversations with me about such a horrible and traumatic subject as my mother’s suicide. They didn’t have to. They probably didn’t completely want to – especially on camera – but they stepped up for me, because I asked and because they knew it would help me. Every one of them also pitched in to make this shoot happen with travel, accommodations, and location, showing generosity of spirit in giving more than just their time and emotions. The family’s trust in me to tell our story in a documentary is huge. Yes, my career has been in TV production and, in one of the biggest surprises I discovered in the interviews was that my dad watched some episodes of My Big Redneck Weddingwhen I produced it, but they admittedly don’t have a full feel for all that I’ve done over the years. And if they do think about what I’ve done, it’s usually Redneck Weddings or Hogan Knows Best. I admit it’s hard to explain as the job titles and tasks are ever evolving, dependent on the shows but this was the real deal and the first time any of them would see me “do my thing” and it was on my mind that things needed to run smoothly. Now I’ve exposed my inner most feelings and everything my “wacky” career has led to with my production coordinator, location producer, and interviewer skills full display to them and thanks to all involved – no major screw-ups! The personal satisfaction of a job well done in front of an audience (and one that I felt would be judgmental on various levels) mixed with professional satisfaction of hitting this milestone and bringing to life what I’ve been talking about for almost 2 years and was a good feeling too big to completely process at that moment. The idea for this film came to me in a flash while in a support group with suicide loss survivors within months of their loss. I was emotional acknowledging how beautiful it was that they could all express their feelings so well so early on, explaining how in my family “silence was golden.” I was being a smartass, but that’s who I am and that’s when inspiration struck. Already “in between jobs,” as we say in the freelance world, I decided to make this documentary my job. I’ve sacrificed a lot lifestyle-wise by turning to fulltime house/pet sitting to accomplish this, but also gained so much in terms of time to focus on getting done what is now truly happening, and I now have so many furry creatures to love. Former boss from my job at MTV (when they played music) who taught me how to make docs is now directing my film. And taking selfies on the plane. Typical production projects I work on are handed to me with a budget, a concept, a company and core support systems in place to make things happen, and within those parameters the creativity with casting and story can happen. With this film, though, I had the concept, the cast and the framework of the story, I just needed to figure out how to build the production up from scratch, start an LLC, find funding, negotiate prices with vendors, get paperwork signed, sealed delivered, etc, etc. It seemed like an endless process, but suddenly we were there. One by one the things on my “to do” list got checked off, I was on the plane, the crew arrived, the first interview started, more conversations, it was done. And I did occasionally think to myself – I did this. I got help from generous donors, my A-team director Jon, co-producer, Jamie, and DP Chris, all people from different parts of my worlds colliding and all who have stepped up so tremendously to help. Because I asked. That’s what was hardest to do but that’s what I did. My sister and I having a heart to heart – finally making my grandmother’s wish for us to be close come true! Above and beyond getting answers to numerous questions, assumptions, and perceptions I’d held for the 30 years my family spent in silence about my mom, what has meant the world to me is the constant support from them and others who see the of the value of having these conversations documented along with friends, strangers, suicide prevention volunteers, and all those I meet who have been silent about their own losses or suicidal crises who encourage my mission. Our story is being shared as an example of many families who don’t talk about important issues and to encourage those still suffering in silence to share their story with someone. Anyone. It honestly never occurred to me to find people outside my family to talk to about this in the three decades I was acutely aware my family wasn’t dealing with it. Finding those people at a charity walk opened up this whole new world to me and gave me the courage to then turn to my relatives. 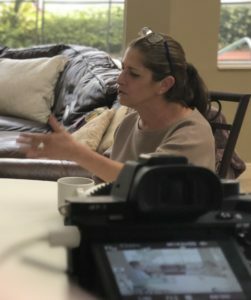 With these interviews, we will be editing an official trailer to be completed by the end of April to use for three grant applications deadlines, to reach out to prominent loss survivors for help with funding and bringing attention to the film/cause, and to seek partnerships with documentary film companies. To expedite this process, we are now crowd funding $5000 to film certain visuals and create elements to complement the storytelling in the on-camera conversations and represent the full film we envision! Please help us keep the momentum going! •. All donors, regardless of amount, are currently listed on our website memorial page as supporters of suicide awareness with the option of having a memorial credit honoring someone lost to suicide. Donations can also be anonymous. • Donors giving $500+ get memorial credit with a photo of their loved one. Donations are accepted by the International Documentary Association* for payment as we are under a 501c3 Fiscal Sponsorship with them and contributions are tax deductible. Please note the online donation form does not have a space to note any memorial information. All donors will be contacted directly when we are notified it’s been received to get that and other credit information. I think – I hope – when I look back at 2018 in years to come, it will flash by like a montage in a movie that connects a moment of revelation to the important action that determines a character’s purposeful and happy future path. In many ways I’ve been living a dream existence for a little over a year. My love of dogsitting grew word-of-mouth into an almost fulltime gig. 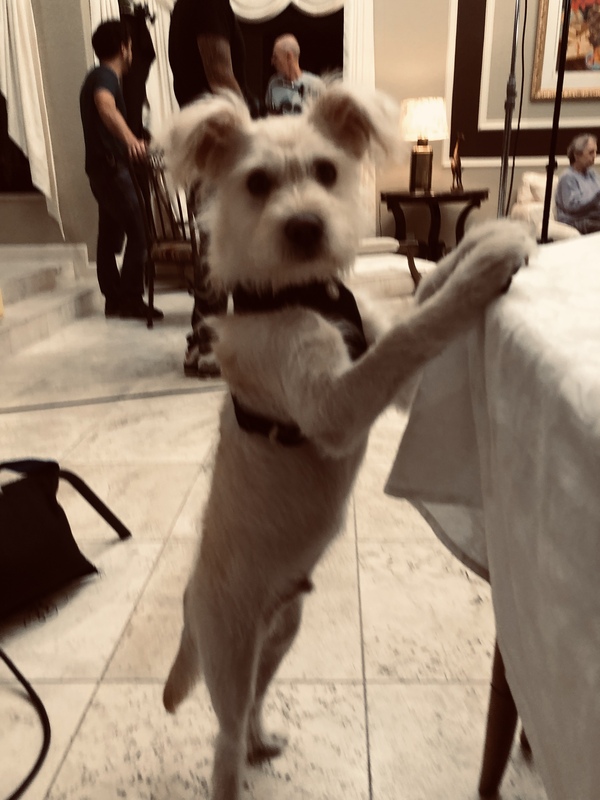 I’ve been lucky to pick up clients who live in beautiful homes, many with pools, where I stay with the various dogs and cats I’ve now fallen in love with – like Gigi, pictured above. This existence has allowed me the time and space to focus on my documentary project, volunteering, and have the sense of freedom that I seem to crave. Unfortunately, the forces of anxiety and depression were strong with me this year – something that all of these wonderful things couldn’t keep at bay. This thwarting of desire to enjoy and be present in this unique chunk of my life devoted to my passion project added to the overall frustration I felt with myself and the world and my sense of hopelessness. 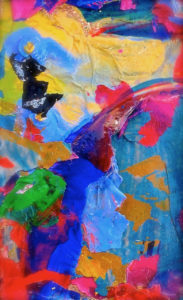 The lessons learned over the years from my constant struggles with these energy-zapping conditions sent me back to therapy later rather than sooner, but way earlier in a spiral down than before! Basically, my need to serve others overwhelmed and conflicted with the expectations I put on myself to get through the “to-do” lists of my own life and the film. Since then I’ve made some baby-steps toward creating boundaries with others and being more realistic about what I can accomplish in a day. Instead of always setting myself up to fail and focusing on what I don’t get done, I’m trying to pave my road with little wins by acknowledging what I doget done. My resolution for the coming year is get keep getting incrementally better at that. I’m excited for 2019 as it will start the next chapter in my life. On January 28 filming will officially begin for The Silent Goldens documentary! I’ll continue writing blogs and include production news as we work. Additionally, I will soon be launching an interview series on this site with other suicide loss survivors about their own choice to speak out publicly with their stories. Thank you to all who have been following this journey through these posts. I’m fascinated to see what comes next and I hope to keep you interested as well! 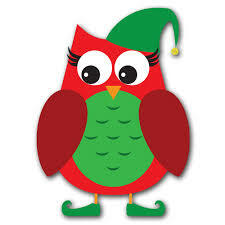 I wish you all health, happiness, love, and good communication with others in your life as we approach the New Year. To those who need it, I add my wishes of and healing, comfort, and peace. Trying to explain my chronic anxiety to others, even my doctors, always raises my level of anxiety. I get frustrated trying to describe why one day a minor problem might be rage inducing, while on another day it might barely register as a problem. I can’t articulate how my list of things to-do on paper is ceaselessly running through my mind as “must-do now” list, which I constantly reprioritize. If I have conversations about it, I leave them ruminating about something I said, the way I said it, or what else I should have said. When my anxiety level is very high, I do have a physical sensation of a hand on my back between my shoulder blades nudging me forward, like it’s saying “go, go, go” only I have no clue where I’m supposed to go or what I’m supposed to do. I’ve never able to accurately described the baseline level I live with however, until a revelation a few years ago during the holiday season while listening to the 24/7 Christmas music radio station. The intense rolling beat, the triumphant vibe, and the familiarity of the melody have put this song into heavy rotation on my personal device playlists for years. Then one day as I was listening felt more connected to it somehow, like my mind inside my head was bobbing along. The underlying beat and the repetitive short bursts of tunes felt more driving than rolling, much like the hand I feel pushing my back. The back and forth between the instruments felt chaotic and overwhelming. Even in the quieter parts of the song there’s an ominous anticipation of the crash of the drum and the intensity ramping back up. At the end, you feel a little drained. This is what it’s like in my mind. My brain is constant motion and my thoughts are repetitive and invasive, constantly telling me to do more. The varying intensity of my anxiety always affects my mood and sometimes my ability to function. When my levels are low, the anxiety feels like background music – but it’s still there and I remain ever vigilant waiting for the next thing to trigger me. The busyness of just thinking can sap all my energy. Now when I hear the song I find it amusing to have this thing has always given me joy be useful in describing my distress and am comforted that for all 3:25 of the song I feel understood. Where words fail, music speaks my mind. Stacy Parker and Ruth showing off their living quarters at Kibbutz Yahel near Eilat, Israel. 1986. No idea who or what is happening on the lawn – or with our hair. 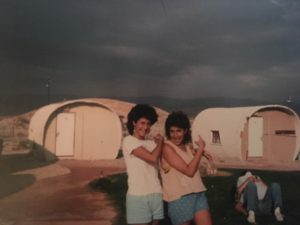 In January 1986, a year after my mother died, I enrolled in a semester abroad program in Israel on the pretense of sparking my interest in returning to college but in reality to escape home when my father remarried. One of the people I became close to on the trip was Stacy Parker but we did not stay in touch for long after as she lived in California and I was getting ready to move to NYC both in the midst of launching our “real” lives. She knew my mom had died, but, as she has now told me, I did not speak about it at all and she didn’t feel able to ask because of her own aversion to the subject at that age. I knew through the grapevine that she had lost her first-born daughter, Alyssa, in 1997 at age 2, but only when we became Facebook friends years later did I learn how involved she was with organizations dealing with palliative care and hospice for children because of her experience. I also realized how close she lived to me and when I was ready to face my own grief and get involved with suicide related groups, I reached out to her to better understand the nature of volunteering in the grief world. Our friendship resumed over lunch as if no time had passed as we shared our stories of loss, the need to talk about it, and the desire to use our pain to help others suffering. Even though suicide wasn’t a common factor in our losses, the traumatic nature of them was. While our discussions often focus on grief and death, it is never in a morbid way. It’s been normal for Stacy for years and her comfort talking about it helped mine grow. Spending time at her home and with her husband and teenage son and daughter impressed on me how someone who has passed can be kept ‘alive’ in a way, as there are pictures of Alyssa around and they honor her during special occasions. She is not some memory too sad and upsetting to be discussed nor does her presence overshadow their present life. 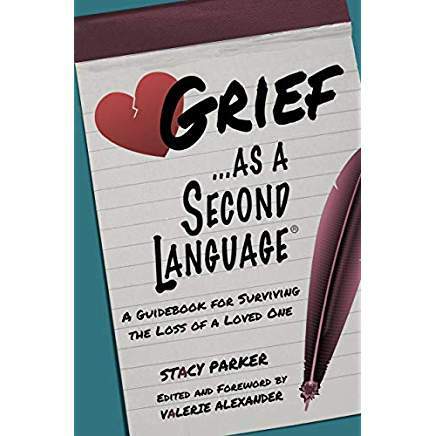 Stacy has known about my idea for The Silent Goldens documentary since it’s very early days and has been supportive and helpful in multiple ways and I was happy to return the favor when she asked for some input on her latest project, a new book called Grief As a Second Language, which is now on Amazon. She even uses my story as an example in one of the chapters – but you’ll have to read it to find out which one! Having experienced traumatic grief after my mother’s suicide, I found this book covered the wide range of feelings and experiences I faced in the aftermath. With the author so openly sharing her story of losing her daughter and how she got through the worst of it, the book reads like a letter from a friend who understands, not an expert listing generic advice about dealing with the “stages” of grief. The details of everyone’s story are different but loss brings on many common emotions and situations that only others who have experienced can truly understand. Stacy simply shares what she learned and did to give others the space to come up with a way to start healing that works for them. I’d recommend this book for anyone with a recent loss or anyone who wants to prepare for the inevitable sadness we all must face. I’m excited to go to her book party on Jan 8 and get my signed copy!!! My first trip home from college was for Thanksgiving 1983. 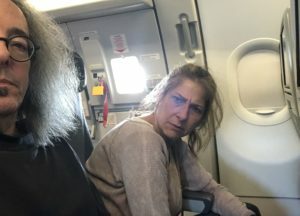 My flight from Minneapolis to Houston on the very busy day before was cancelled due to snow, so my arrival was delayed until the holiday itself. I was greeted by my father at the airport and we chit chatted about my trip while we waited for my luggage. There was no clue that life as I knew it was about to change forever. In the car my father announced that my mother had cancer. The diagnosis was Hodgkins disease and she would be going through radiation treatment. Cancer wasn’t talked about much at that time and even though I was assured this was a treatable kind, the “c” word brought very dark thoughts to my mind. The ride home took about 50 minutes and I was only beginning to absorb this information when we arrived home. Mom was sitting in the living room in a chair wearing a long, loose dress and holding a pillow to her stomach. Right before my finals at school my parents did tell me she was having her spleen removed due to an infection or something. Their explanation didn’t seem completely right from my limited knowledge of diseases but I went with it. Now it made sense. I really don’t remember anything my mom and I said to each other. I don’t remember taking the picture (above) of us ready to go to turkey dinner. What I do remember is soon after arriving being told by my mother to take a shower and get dressed to leave for the Finklesteins in an hour. The whole dinner was a blur. I couldn’t understand how they could throw this news at me and then expect me to have a fun Thanksgiving dinner with 20 people. I couldn’t understand why my mom, with this scary diagnosis and still in pain from surgery, would want to go to Thanksgiving dinner. When I am distressed I shut down. I isolate. I wanted to be in my room. Her goal, I would learn more than 30 years later when I finally asked my father about it, was to keep things as normal as possible – for her and for us. I understand appreciate that was her intention but my coping mechanisms at the time were not that mature. Even now I’m still working on honing them. School is top priority and mom’s illness will distract you so we won’t talk about it. Act like everything is ok and keep moving forward no matter what. I was incapable of not being distracted but didn’t have the courage to break through my parent’s unspoken ban about speaking of the cancer beyond the basic medical factual updates. I don’t know how good I was at acting like everything was ok then, but over the years any skills I had have deteriorated significantly. 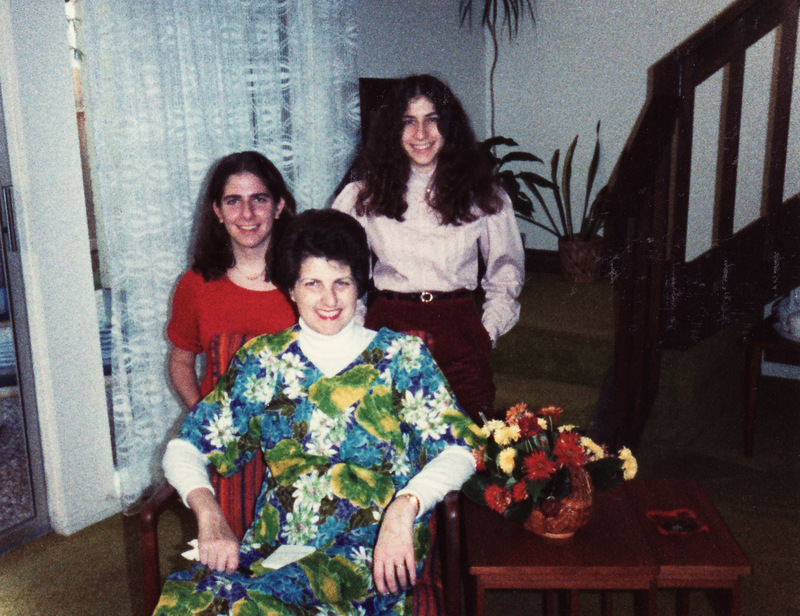 That day set the stage for the handling of the events to come when just over a year later my mother killed herself and the family went silent about it – and her – for the next 30 years. The day after her funeral my father dropped me back at my dorm room with instructions to get back to normal and move forward. That was impossible for me and I soon dropped out of school. While I was able to forge a career in tv production, live independently and support myself, I still feel 19 emotionally and have not grown into a “normal” adult life. I am not married. I have no children. I do not own anything of significance except my 18-year-old Toyota Rav 4. 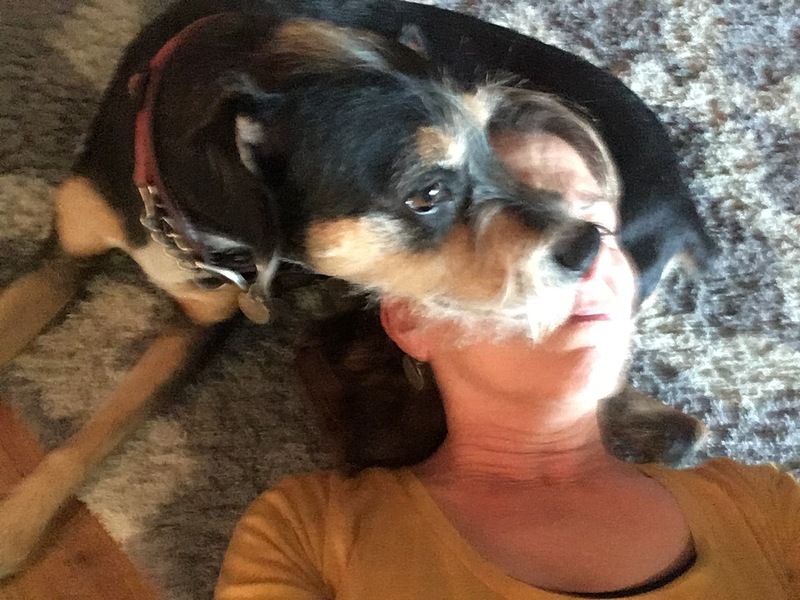 I am currently dog and housesitting for a living while working on The Silent Goldensdocumentary about the damage silence after suicide does to the people left behind and what is said when that silence is broken. I love it, but it’s not a life-long career for me. My life has improved leaps and bounds since I started talking about my mom’s death and I hope the doc encourages others to speak. It truly is a part of healing. Filming starts in January and I feel like I’m ready to get moving and start growing. For me the doc is the first of many projects I have in mind to bring awareness to the silent suffering of suicide loss survivors and the mission to normalize conversations about suicide in our culture. 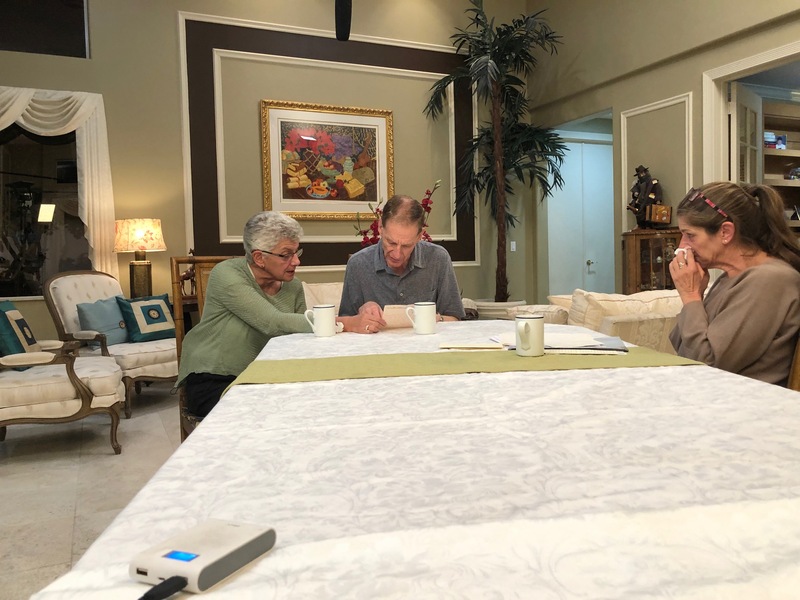 This Thanksgiving I am grateful to my family for agreeing to talk to me about my mom – especially for doing it on camera. I am grateful to all those who have supported this project financially and emotionally since I began it. I am grateful to all the loss survivors I’ve met for sharing their stories, offering me comfort and showing me how my story helps them. I am grateful to my mom for the 19 years I had with her and for leaving me a story to tell. I wish it was a better, happier story covering a much longer span of time, but it’s a story that has given me a clear purpose and path for my life that honors my mother’s passion for helping others. Fundraising for The Silent Goldenscontinues! We’re just $25,000 from our end of year goal for our filming budget. Please help us with a tax-deductible donation, add your voice to a good cause. Memorial donations honoring those lost to suicide are encouraged! My initial intention for this blog was to talk about how overwhelming the negativity, hate and violence that’s transpired recently – especially during this past election season – can be. I started to write after the Pittsburgh synagogue slaughter. Then came the Borderline massacre in Thousand Oaks. Then came the fires. I am grateful to say that so far, the people I know that live in Thousand Oaks and in other fire zones and their property are all ok. Personally I am fine, just dealing with a bit of smoky haze like so many others. It is still horrifying and overwhelming to process, especially when there is so much help needed but you feel helpless to do anything. Friends – online and off – have been working to help coordinate animal rescues, donations, and housing for those in need in disaster areas around the country while others have spent months campaigning tirelessly for issues and candidates they cared about. Whenever there is a crisis, I feel compelled do something, but am quickly overwhelmed with trying to decide what, how, and when I would do it and, probably most significantly, would my participation even make a difference. I found out some answers four years ago when I began volunteering with the American Foundation for Suicide Prevention in Los Angeles. Dealing with my own deep depression, I finally started talking about my mother’s suicide 30 years before, something my family never spoke about. For me, hearing others’ experiences validated so many of mine and allowed me to see my family not as detached strangers, but as human beings who were also in pain. Others have told me how hearing my story has helped them. Strangers and friends now open up to me about suicides in their lives. Discovering the power conversation has to shift long-held (often made-up) beliefs with truth and understanding for me is leading to compassion and forgiveness. While public discussion around suicide has come a long way in the last couple of years and I fear the cause and the resources going to it will get lost in the shuffle of the numerous crises that keep pulling the nation’s attention. Sadly, suicide isn’t going away anytime soon and new loss survivors are created daily. Right now I need to keep my focus and my inner resources on shining a light on the suffering of those left behind. The Silent Goldens documentary I am producing is my way to forward the movement to normalize the conversation about suicide. I can be effective in this mission. I am devoting my time to it. I have seen my participation so far in the suicide world make a difference. I have a lot more to bring to it. Please help me share my story with a donation to the production at thesilentgoldens.com. Throughout the fall the American Foundation for Suicide Prevention holds over 400 Out of the Darkness Walks across the country. The money raised supports the foundation’s work in research, education, and survivor support. Thousands of people write #whyiwalk essays, sharing their connections to the cause over social media. Here is mine. Full disclosure – I haven’t actually walked the walk, but on Saturday, will be my 4thyear working as a volunteer. I’ll be at Central Park in Pasadena, CA. 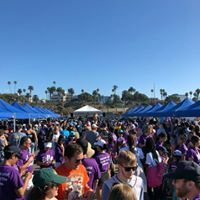 I first helped in 2015 at the Santa Monica Walk. 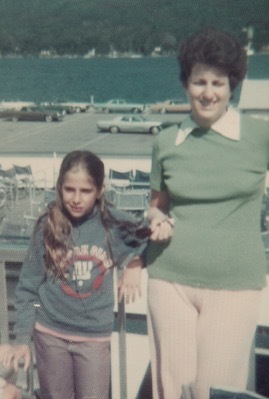 It was a time in my life when I was just starting to really deal with my mother’s suicide – 30 years after it happened and my family stopped talking about it. When I met my fellow volunteers, they introduced themselves and stated their loss. I did the same. Suddenly I was having open, uninhibited conversations with people who “got it.” The dark clouds that hung over this part of my life started to part a bit. 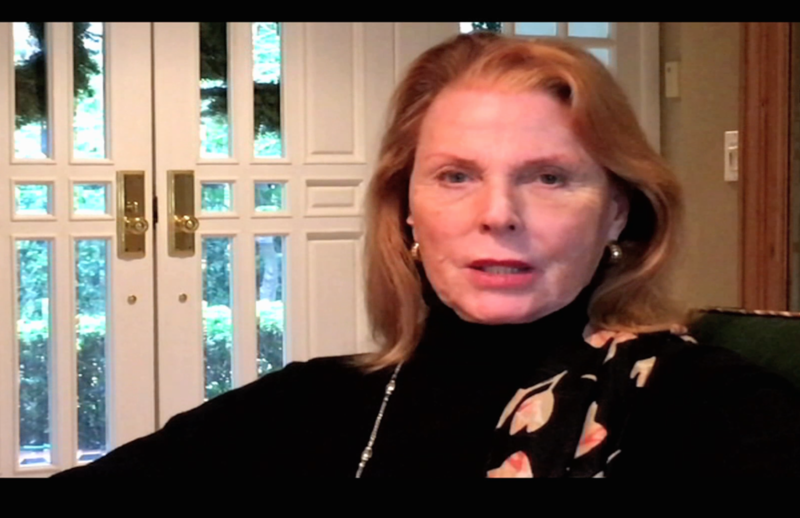 Those conversations led me to seek out a support group, which inspired getting my family to open up for the first time for The Silent Goldens documentary. Just having conversations about the project opened the door for people to share their stories with me. Their pain always feels familiar. The sense of community at these walks is what keeps me coming back. The healing I’ve felt, and knowing I’ve comforted others keeps me coming back. Being able to openly honor those we’ve lost keeps me coming back. The overall feeling of hope and love keeps me coming back. 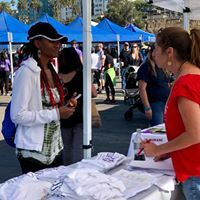 I found purpose through volunteering at the walks and became active with the AFSP Greater LA. It’s important to me to stay involved to give back to other survivors what they have given to me, and prevent who will, unfortunately, face suicide loss in the future never feel they have to be silent about it. Find a walk in your area or get all the info for Nov 3rd in Pasadena! I left my wallet with debit and credit card at a friend’s house and found myself with no cash this morning and no access to get any for a few hours. Desperate for a Diet Coke, I scrounged up $1.26 in dimes and nickels and found a winning scratch off lottery ticket that I could redeem for $1. My plan was to trade the ticket for the dollar can of soda and look for a snack I could afford. When I asked how much the Hostess Donettes cost the cashier said $2 so I put them back and said “nevermind.” He asked how much I had in the way that I understood I could buy them for the $1.26. I said “it’s ok” and grabbed my can of Diet Coke. At the register I asked to trade the can for the ticket then realized this gas station didn’t sell tickets so they wouldn’t redeem them. He offered to take it anyway. I told him there was no need as I had a dollar. I nodded to the guy now waiting behind me to go ahead and began to count my change out. Suddenly the guy who went ahead held out a $5 bill for me to take. My eyes got watery at the unconditional generosity and compassion I was being shown by these men. I did refuse but thanked him and explained that I did have money, just not at that second. I can now say for certain random acts of kindness do their job. The one aimed at me, though not needed, made my day a whole lot better and gave me some hope for us all. I will pay this one forward big time!